1. 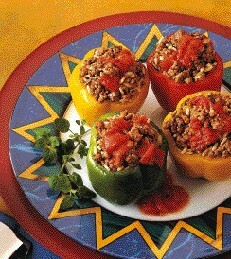 Heat oven to 350 degrees F. Cut tops off bell peppers; remove seeds. In large bowl, combine filling ingredients, 1/2 teaspoon salt and 1/4 teaspoon pepper, mixing lightly but thoroughly. Spoon equal amount of filling into each pepper. Place in 8" x 8" baking dish. 2. Combine sauce ingredients; pour over peppers. Cover dish tightly with aluminum foil. Bake 1-1/2 hours. 4 servings.